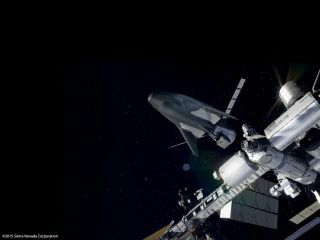 Artist's concept showing Sierra Nevada's unmanned Dream Chaser Cargo System docking to the International Space Station. A robotic space plane may start ferrying supplies to and from the International Space Station a few years from now. Sierra Nevada Corp. today (March 17) revealed details about the autonomous cargo version of its Dream Chaser space plane, which the company hopes NASA chooses to fly the next round of cargo missions to the orbiting lab. The company also unveiled a video animation of how Dream Chaser could deliver cargo for NASA. Two American aerospace firms — SpaceX and Orbital ATK — currently hold billion-dollar NASA contracts to make cargo runs to the space station. Last year, the space agency solicited proposals for the next round, which is known as Commercial Resupply Services 2 (CRS-2) and will cover deliveries from 2018 through 2024. Sierra Nevada is among a handful of companies challenging the incumbents in CRS-2. Boeing, for example, is developing a cargo version of its CST-100 capsule, and Lockheed Martin is designing a system consisting of a disposable cargo module and a reusable space tug called Jupiter. The total value of the CRS-2 award is potentially as high as $14 billion, Sirangelo said. NASA has said it will make its decision in June, and the agency is widely expected to give contracts to more than one company. Sirangelo thinks Sierra Nevada's entry, known as the Dream Chaser Cargo System (DCCS), should be one of the winners. "We believe it's the best cargo solution that currently exists, and will exist," Sirangelo said. The autonomous cargo version of Sierra Nevada's Dream Chaser space plane is seen on orbit in this illustration. An illustration shows Sierra Nevada's nncrewed Dream Chaser spacecraft inside a standard 5m fairing. Dream Chaser is a winged minishuttle that blasts off atop a rocket and lands on a runway like an airplane. The vehicle leverages the technological heritage of NASA's space shuttle program, which came to an end in July 2011 after 30 years of orbital service, Sierra Nevada officials have said. Sierra Nevada has been developing Dream Chaser as a crewed vehicle for more than a decade. Indeed, the company sought a contract to fly NASA astronauts to and from the International Space Station (ISS), but last September lost out to SpaceX and Boeing, which are building capsules (called Dragon and the CST-100, respectively). The DCCS vehicle is similar to the original piloted Dream Chaser, with a few key differences, Sirangelo said. The cargo variant has foldable wings so it will fit inside a 16.5-foot-wide (5 meters) launch fairing; it features upgraded software that makes the space plane fully autonomous; and the system incorporates a cargo module that attaches near Dream Chaser's tail. The space plane would come back down to Earth after completing its resupply mission, returning scientific experiments and other "down mass" in a gentle glide that never exceeds a g-force of 1.5. (The acceleration of gravity at Earth's surface causes a g-force of 1.) The cargo module, meanwhile, would burn up in the planet's atmosphere. DCCS could carry 12,125 lbs. (5,500 kilograms) of cargo up to the space station on each flight and return 3,858 lbs. (1,750 kg) to Earth. Up to 10,472 lbs. (4,750 kg) could be disposed of on every mission's return leg, Sierra Nevada officials said. As currently envisioned, DCCS would launch atop a United Launch Alliance Atlas V rocket, though it's designed to be compatible with a number of other rockets, Sirangelo said. Sierra Nevada's Dream Chaser spacecraft will be compatible with the Atlas V and Ariane V booster rockets. Diagram showing the robotic resupply variant of Sierra Nevada's Dream Chaser space plane, which incorporates a separate cargo module. The DCCS variant doesn't signal the end of a crewed Dream Chaser. Sierra Nevada still wants a piloted version to take flight someday, and Sirangelo said the changes implemented for the cargo vehicle should actually help bring that vision closer to reality. "Everything that we're doing in this vehicle is transferable to a future crewed vehicle," Sirangelo said. "We actually think we're enhancing it and accelerating that crew capability." In fact, the company sees Dream Chaser taking on a number of roles in the future, in both its robotic and piloted versions. "This is and continues to be a multimission vehicle," Sirangelo said. "Our solution is really something that goes beyond ISS." Sirangelo said Dream Chaser's unique design gives the spaceflight community added flexibility. "There are many capsules in the world; there's really only one vehicle like Dream Chaser that's commercially available right now," he said. "None of us know what the next decade of space is going to be like, and having capabilities like this available continuously [keeps] our options open."